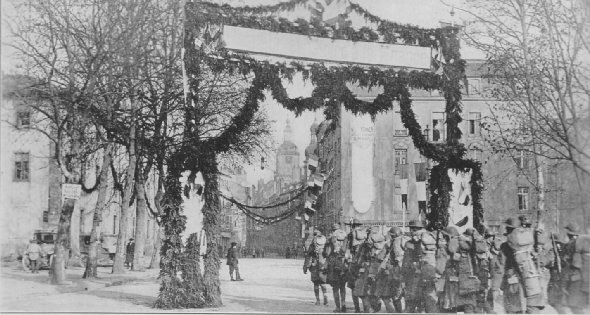 "THE ADVANCE OF THE GRAND ARMY"
Under an Arch of Triumph which has been dedicated to "the Honor and Glory of France," the 59th Infantry, 4th Division, marches into the city of Thionville, on way to the Rhine. Thionville is an ancient and picturesque city. 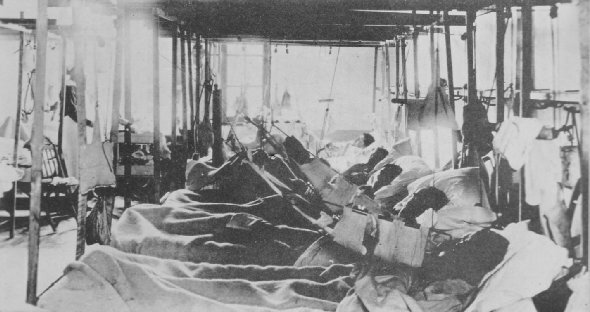 Over two hundred thousand war-shattered American soldiers were confined in hospitals back of the lines when their buddies in the Army of Occupation advanced to the Rhine. No share of the thrill of march with a victorious army was for them. This is the Fracture Ward at Evacuation Hospital No. 1, Sebastapol, France.